These are the towels for the Towel Exchange. My sett is a little tighter than the 24 epi that many handweavers use for waffle weave in 10/2 cotton. 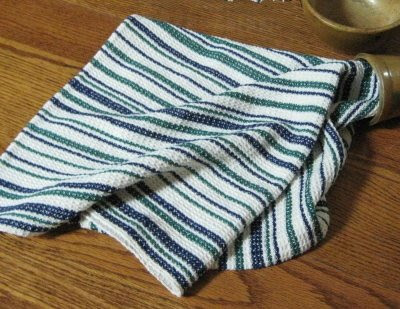 My sample was done at 30 epi however, and when I asked my DH if he thought the fabric was too thick for dishtowels, he responded with a definite no. He liked their thick, thirsty feel, so I left the sett as it was. I finished hemming them yesterday afternoon. After looking all the suggestions you all shared last March (see Hemming Handwoven Fabrics), I decided to serge the fabric and then hand hem. I like my serger for this, as it cuts and binds the edges at the same time. It was easy to fold under and hem. My only concern about the hems is that they are a little thick. However, no one seems to have any luck using plain weave weave for the hems, as the plain weave doesn't draw in enough. My other option would have been to use a finer cotton or sewing thread as weft, in waffle weave. But I have neither; not in cotton anyway and I didn't want shrinkage (or non-shrinkage) issues! If these were for myself, I would have been willing to experiment, but not for a towel exchange. I still have to make up 20 project sheets, but they aren't due until November, so I have time for that. We will exchange two towels each, and then receive project sheets (with fabric samples) from all participants. Hopefully I won't procrastinate on those either! They do look nice and soft! Nice size too. Good to know the size you like - there seems to be a lot of different sizes in the Handwoven patterns. I like them but they don't look very waffle-like in structure. Is this a photography issue? I wouldn't worry about the hems. These are meant for rugged use, not for an art display! I added a close-up! Does it look waffley now??? I love the stripes! They just look so well placed. Thank you, Leigh, for the close-up. I love your towels. I'm glad you included sett weave and hemming information. The bar code idea sure did work out. Isabelle, I get 10/2 unmercerized cottons from a variety of places. The natural came from a Yarn Barn of KS mail order special, and the colored yarns came from Webs. I just keep an eye out for their sales, mill ends, and closeouts. I hope you don't mind me joining in on this yarn discussion. I see Lunatic Fringe Yarns still has some of its 10/2 unmercierized cotton on sale. Check out the Good Byes-Limited Quantities. I'm with Leigh always look for the sales. The more the merrier! Thank you for the information. 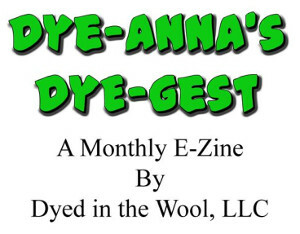 Lunatic Fringe Yarns can be found here. Cute towels! I can't wait to get a loom.